I’ve been eating a lot of sit down Western food lately. This has had me feeling a bit fat. Asian food, particularly street food, tends to be light. Outside of the more oily Chinese, you’d be hard pressed to feel bloated after an Asian street meal. My goal today, other than writing a lot, was to eat only street food. I started off with a decidedly non-Asian street favorite. 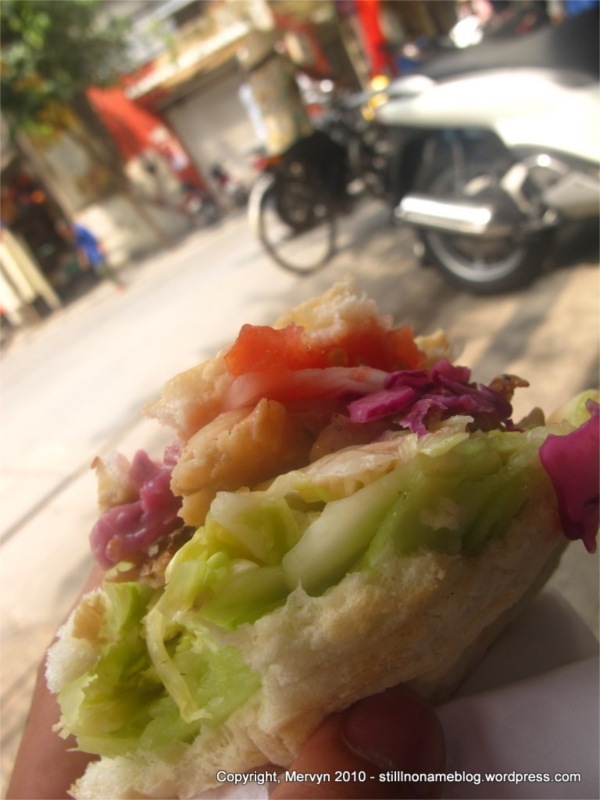 I dropped by a kebab stand that I often frequent when I’m in Hanoi. For 20,000 dong ($1.10 USD), I get a gigantic portion of grilled meat and veggies in flatbread. Eating street side in the fumes and the humidity adds to the flavor. I can’t imagine eating this in an air conditioned restaurant. As an afternoon snack, before hitting the airport for my Hanoi-Saigon (HCMC) flight, I stopped off for some bun cha. I plopped myself on a six-inch-tall plastic stool behind a man squatting on the sidewalk grilling meats. A girl wordlessly brought me a plate of vermicelli rice noodles and a plate of vegetables. A bowl of meat soaking in vinegar and oil sauce shortly followed. Thus begun the challenge: how to eat this. I’ve had bun cha before, but never like this. 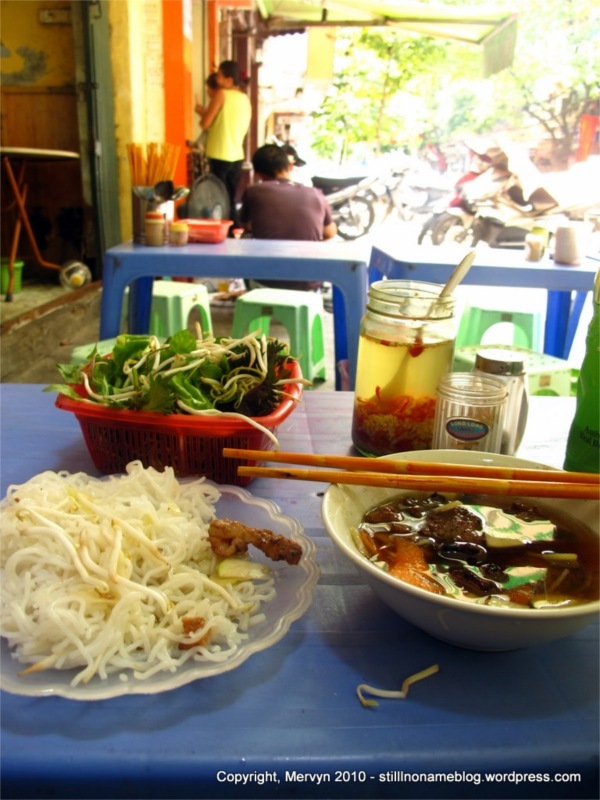 In the past the vermicelli has been in a bowl or similar container. Normally, I’d pour the sauce and meat over the noodles, then strip pieces of vegetable on top and enjoy. Here, there seemed to be a lot more sauce. Dumping the huge bowl on the vermicelli seemed like a bad idea. Dropping the noodles into the bowl of meat and sauce also seemed ill advised. It would have turned it into a soup. Normally I’d look around at what the locals were doing, but none were in sight. I was taking a mid-afternoon snack outside of normal lunch hours. I was on my own. In the end, I opted to dip bundles of noodles in the sauce, bite at the meat, and occasionally stuffing my face with veggies. Basically, I was assembling the dish in my mouth. It worked. The whole experience cost me 30,000 dong ($1.60 USD). From there, I hit the airport for my evening flight. A note to travelers going through Hanoi airport. Get there early if you’re checking baggage. The lines are long and don’t seem that efficient. On the upside, security is a breeze, though I did have to discard my bottle of water. Guess silly security measures have gone worldwide. I ended up on the largest aircraft I’ve ever been on for a domestic flight. Turns out the plane was continuing on to Sydney and Saigon was just a waypoint. We all received an in-flight meal even though we were only in the air for two hours. I guess cost-cutting measures have not gone worldwide. And just like that, I’m in Saigon. Looking forward to a week of writing and eating. GALLERY: None beyond the two pics above.